If you haven’t seen Star Trek: Generations, this post is not for you. If you have, you know these words from Captain Kirk: “Oh, my…” Though it appears some people responded positively to the scene, most Star Trek fans are still smacking their heads in bewilderment, wondering why this line exists. Public opinion skews so much in this direction that, speaking at the Paley Center for Media in 2004, the Shat himself felt compelled to offer an impassioned defense of the improvised moment. In so doing, he hit on the underlying spiritual nature of Star Trek‘s quest. He didn’t remember the line correctly (“Oh, yeah?”), but you can see something of what he means in the film. For the record, here’s the moment in question from Star Trek: Generations. In his description of his process as an actor approaching this scene, Shatner illuminates something essential about the Star Trek universe: One of its driving forces is curiosity. The quest of Star Trek is about the mysteries of our existence. For all the seeming scientific certainty at the basis of its worldview, the Enterprise crew and those of her sister ships and space stations are constantly encountering things they do not understand and cannot explain. In the Original Series, these things were often never explained in the slightest. Aliens had incredible powers with no basis in even wildly theoretical physics. Next Generationcontinued this trend with the character Q. These constant encounters with unexplained phenomena hint at a larger quest for the unknown that moves through the whole of theTrek universe. The men and women of Starfleet are constantly drawn by curiosity. They seem compelled by the desire for an encounter with the unknown expressed by Captain Picard in the closing line of the Next Generation episode “Encounter at Farpoint,” “Let’s see what’s out there.” Ultimately, curiosity is the primary engine that drives the quest in Star Trek. It is perhaps no wonder, then, that Shatner would see the death of Kirk as a moment when, at least for the character, the quest comes to a cosmic conclusion. Throughout his time as Captain, Kirk – like all Star Trek Captains – served as humanity’s primary representative. So the end of his quest is, in that sense, symbolic of the end of the human quest. Shatner was very right, then, to conclude that the death of Kirk must necessarily include a reference to the ultimate revelation of knowledge that is the ultimate fulfillment of the human quest. For all Star Trek‘s anti-religious foundations, its unwavering optimism about the destiny of humanity ultimately demands that the human journey resolve in understanding and fulfillment. As the journey of the individual in Star Trek (and in particular the journey of the Captain) is inexorably intertwined with and symbolic of the journey of the human community, the individual human quest must necessarily have the same end as the collective one. The idea of the mysteries of life and death being revealed when one dies is a Biblical concept. “For now we see in a mirror indirectly,” Paul writes in I Corinthians 13:12, “but then we will see face to face. Now I know in part, but then I will know fully, just as I have been fully known.” (NET) At the same time, though, the desire to know and understand the mysteries of our own existence is universal. It is this universal curiosity and hope upon which Star Trek is based and which the Gospel directly addresses. In Shatner’s words in the Paley Center clip above, it becomes immediately clear that the questions at the core of Star Trek, while they are thoroughly human, cannot help but also be ultimately cosmic. 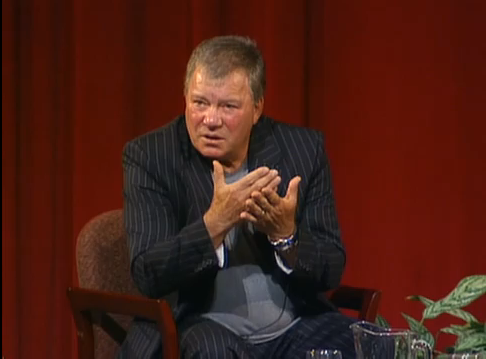 “Where is the soul?” Shatner asks, among other things, echoing questions about Lt. Commander Data’s soul in the TNG episode, “The Measure of a Man.” Ultimately, for all its staunch opposition to religion and to the supernatural,Star Trek continually reaffirms (as it must, for its humanistic philosophy to remain hopeful) that there is a greater dimension to human existence than our mere DNA. Good find and good commentary, Kevin! If I have any notable agreements or disagreements, I’m too tired to find them right now, so I’ll add just a touch of commentary of my own. Shatner did well to say “Oh my” when Kirk encounters the great unexploredcountry of death. Socrates would have said the same thing about theundiscovered country of death. But, with a Lord who was crucified and resurrected bodily, Christians must no longer allow ourselves to say that death is undiscovered. Excellent observation! In my paper in Light Shining in a Dark Place, I talk about the “undiscovered country” line in Hamlet that gives Star Trek VI its title and how Star Trek re-contextualizes this phrase (which I also re-purpose). Hamlet’s ordeal in that moment is based around the notion that the only motivation we have to stay alive is the fear that death holds either damnation or oblivion. In a Christian context, death holds neither and indeed as no power or dominion. Hamlet refers to death (or, perhaps more properly, either the afterlife or oblivion) as the “undiscovered country, from whose bourn no traveller returns.” Yet, one traveler has returned! Therefore, it is both a discovered and a conquered country. Thanks for the comment. More afterlife thoughts in my next post!